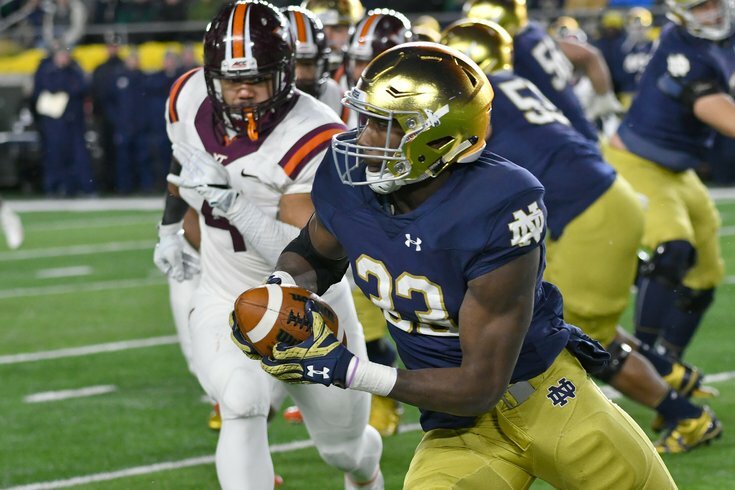 Notre Dame RB Josh Adams is the most recognizable name among the Eagles' undrafted free agent signings. A week before the 2018 NFL Draft, Philadelphia Eagles personnel chief Joe Douglas noted that coaxing undrafted free agents to join the team would be a challenge this year, considering the Birds' stacked roster, which boasts impressive depth. "You would think that because we're coming off a Super Bowl and we don't have a second- or third-round pick that it would be a lot easier (to land free agents) after the draft, but in my experience, coming off a Super Bowl, it's sometimes harder to get guys to commit to your roster because agents and players have a perceived notion that it's going to be that much tougher to make the team," Douglas explained. "That's going to be a challenge for us, and we know it, and we're going to attack it. I think our guys are going to do a great job of recruiting these guys that slip through the cracks like they did last year, but it is going to be a challenge." That difficult challenge considered, the Eagles scored some quality prospects. To note, these reported signings are unconfirmed by the team. We're just giving you a sneak peek at the players the Birds likely added. Adams offers very little in the passing game, both as a receiver and as a blocker, and he explosion as a runner isn't on par with many of the other backs in this draft. However, he'll have a chance to make the roster as a big, powerful back who can run in between the tackles. Yeesh. That's Max Jean-Gilles territory. MJG ran a 8.56 3-cone, just FYI. By comparison, Jason Kelce had a 7.22, Lane Johnson had a 7.31, and Brandon Brooks, at 346 pounds, had a 7.37. What Weathersby does have going for him is LT-RT versatility, as he has played both positions in the same game. While he's not going to be effective in the screen game or at the second level of the defense, perhaps the Eagles can at least develop him into a competent swing tackle who is powerful in the run game and sturdy in pass protection. Thomas had a very weird combine. On the one hand, he put up a pathetic four reps on the bench press, and he ran an awful 4.64 40, which unquestionably scared off a number of teams. Way back in August 2016, ESPN's Todd McShay had Thomas as his No. 1 rated cornerback. Thomas tracks the ball well and routinely comes down with 50-50 balls. He finished last season with five interceptions -- one of which was returned for a touchdown. He projects as an early-round pick because of his combination of size (6-foot, 192 pounds), athletic ability and instincts. But Thomas' off-field decision making -- two suspensions in 2015 and an arrest -- deserves attention from teams. That off-field decision-making includes two different suspensions, as well as an arrest for failing to appear in court after receiving a speeding ticket for driving 94 MPH. He was also arrested in June on charges of "assault and battery, public intoxication and interference with official process." The Eagles have shown that they are willing to add character-concern players since the departure of Chip Kelly. On the field, Thomas wasn't nearly as good in 2016 and 2017 as he was in 2015. CFB Film Room had him down for seven touchdowns allowed in each of the last two seasons, with just three interceptions. That's very bad, clearly, and it's why he went undrafted. Still, Thomas has good size and talent. His short-area quickness could be an asset in the slot in the NFL. Ostman was a highly productive pass rusher in his final season at CMU, where he had 60 tackles (19.5 TFL), 14 sacks, and 3 forced fumbles. His highlight reel is fun to watch, and he looks to dish out as much punishment as possible on the quarterback whenever he gets a chance. At a minimum, Ostman should give the Eagles' offense a handful to deal with in camp, but it'll be tough for him to crack the roster in an extremely crowded DE group. He'll have to stand out in a big way on special teams. Neal is the little brother of former Packers edge rusher Mike Neal. The younger Neal is a defensive back with experience both at corner and safety in college, which will appeal to Jim Schwartz, who likes his safeties to have some corner in their backgrounds. Neal had 84 tackles and 2 picks in 2017. Reaves is another corner who moved to safety, and was the Sun Belt's Defensive Player of the Year in 2017, filling up the stat sheet in the process. In 2017, he had 104 tackles (7 for loss), 1.5 sacks, 3 INT, 8 pass breakups, 3 forced fumbles, and 2 recoveries. Reaves is perhaps best known for being a vicious hitter. Here's his game this season against Oklahoma State's dominant offense. You'll see a couple a big smacks here, but more importantly, Reaves shows ability in coverage from the slot, and as a sound tackler in the run game. The Eagles clearly lack depth at safety, and Reaves makes a lot of sense for the Eagles, who brought him in on a pre-draft visit. Hector is an interesting find. In three seasons (31 games) at South Florida, he had 18 sacks, an outstanding total for an undrafted defensive tackle. Surely a part of the reason he wasn't drafted was because of his smaller size at 6'2, 296, but he fits the mold of an upfield, penetrating interior defensive lineman that Jim Schwartz wants. The Eagles have a great DT duo in Fletcher Cox and Timmy Jernigan, and quality short-term depth with Band Aid signing Haloti Ngata. Hector could potentially push Elijah Qualls and Destiny Vaeao for that final DT spot in the rotation. The Eagles are an interesting choice for Briscoe, seeing as Philly is set with three quarterbacks. It's worth noting that Nate Sudfeld had a number of opportunities after the Redskins released him after camp last season, and he chose the Eagles because he felt they were the best team to develop his skill set. Perhaps that, along with the fact that Carson Wentz almost certainly won't participate much during training camp, thus leading to more reps for everyone else, is why Briscoe chose the Eagles. Sullivan was good enough to get an invite to play in the Senior Bowl this offseason after four years as a starter at Georgia State. He was also a Combine invite, where he ran a 4.6 40, so his ability to stick with faster receivers at the next level will be in question. Interestingly, Sullivan reportedly received the second-highest signing bonus among the Eagles' UDFAs this offseason. The Eagles will likely think of Sullivan as a slot corner. Evans played tackle for UCF, but will likely move to guard at the next level. The Eagles spent their final two draft picks on offensive linemen, and Evans and Weathersby are formidable undrafted players worth signing, who will fill out the third-team guard spots in camp. There's a highlight reel of Evans on the Patriots' website. While it is interesting that the Eagles are reportedly bringing in two undrafted quarterbacks, Silvers is probably little more than a camp arm. Here's a highlight reel. Silvers doesn't offer much in the way of any high-level traits, or statistical production in college. The Eagles only have four safeties on the roster presently, so they need to fill out a third team defense for camp. • Asantay Brown, S, Western Michigan: Brown had impressive tackle numbers in college, racking up 296 of them the last three years. At 6'0, 215, maybe the Eagles will have him put on some weight and try him at linebacker? • Jordon Gandy, WR, Murray State: Bigger guy at 6'4, 210 who put up stats lines of 62-976-11 in 2016 and 65-954-10 in 2017. • Danny Ezechukwu, LB, Purdue: Thicker guy at 6'2, 250 in the same mold as Dannell Ellerbe. • Anthony Mahoungou, WR, Purdue: Another bigger guy at 6'3, 210, who put up a stat line of 40-688-8 in his only season with notable production at Purdue in 2017. • Ian Park, OG, Slippery Rock: Guard/center versatile player who also started for Northwestern.